Explore Bordeaux and France in a high quality, affordable Sixt car hire from Bordeaux Airport. Our branch at Bordeaux airport is conveniently situated on the ground floor of the arrivals terminal. In addition to our comprehensive vehicle fleet we also offer a wide range of extras to enable you to customise your rental experience and travel freely; this includes the possibility of unlimited mileage, additional breakdown cover, sat nav systems and more. Should you need to return your car out of opening hours, you can simply drop your car off at any time to suit your flight and leave the keys in our 24 hour returns key box. Bordeaux Airport (BOD) is one of France's many large international airports and serves as the major transportation hub for Bordeaux as well as Volotea. As we are located within the arrivals hall of this huge airport, renting a car from Bordeaux airport with Sixt will get you on your way without delay and allow you to transfer to your next destination in no time. 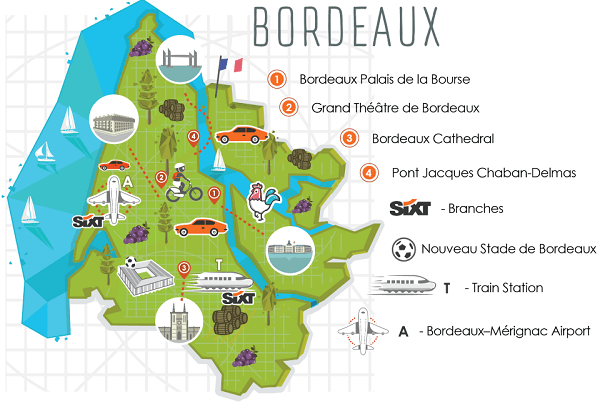 Once you have collected your vehicle from the Sixt Bordeaux Airport station you can find yourself in the city centre in just over 30 minutes, from here you will find a whole collection of fun things to do and attractions to check out. The Place de la Bourse (Place Royale) is situated directly in the city centre and is a popular attraction for tourists and sightseers alike. If you are feeling more adventurous then we would suggest taking your rental car for a drive across the Ponte de Pierre, a beautifully sculpted stone bridge spanning almost 450 metres across the Garonne River. Bordeaux is also famous for its stunning wine region and is home to rolling hills of vineyards and a number of wine tasting tours. Remember: France has very strict drink driving laws so be responsible! You can always insure an additional driver, to share the driving in Bordeaux. You will pick up your rental car at the Sixt branch, which is located at the ground floor (Arrivals) in Hall A of the terminal. The car rental parking is located just in front of the airport (exit at Terminal Gate 1; the Sixt cars are in aisles K2/L2/M2). After the final roundabout: - Go towards "Aérogare" (Terminal) - Stay in the left-hand lane until you see the sign for "Arrivées - Locations de voitures" (Arrivals - Car Rental) - After passing the P1 paid car park, turn left towards "Locations de voitures" (Road has no entry barrier or tickets). - Continue straight on until you see the Sixt signs. Our spaces are in aisles K2, L2 and M2. When the cabin is closed, please return the vehicle's keys to the desk in Airport Hall A (a key box is available). Please leave the vehicle on the Sixt parking (car rental parking - without barrier) and drop off the key in the keybox at the backside of the booth.